Description: The Taurus 99 offered what Beretta never did: Adjustable Sights. This PT99 served with Caribbean Law Enforcement. It was manufactured in 1993.Manufacturer was Forjas Taurus, S.A., of Porto Alegre, Brazil. Importer Construction is alloy frame with steel barrel, slide, trigger and levers. Class is Beretta 92 type short recoil operated semi automatic pistol. Chambering is 9mm Luger, 9mm Parabellum, 9x19, call it what you will, THE 9mm. Barrel is 5 inch Government Size, 6 groove 1:9.84 right hand rifling. Slide is open top with serrated rear laterals and non glare matte upper. Its guide rod is steel, not polymer. Extractor doubles as a loaded chamber indicator. Front sight, like the parent Beretta, is integral to the slide with red dot insert. Rear sight is matching slotted, pinned in, windage and elevation adjustable with white dot inlays. Trigger is polished surface .350 smooth faced, 1 1/8 inch travel distance on double action; and 1/2 inch two stage single action pull. Pull gauges 6 pounds on single action, with minimal felt creep and overtravel. Hammer is .300 modified Commander type black matte steel. Main safety levers are extended serrated ambidextrous, and they serve as decockers. Main safety will engage with the hammer fully cocked or completely resting. The PT99 also has a firing pin safety. Magazine release comes set for right handed shooters, but is readily reversible for southpaws. Frame is type two smooth square trigger guard, no rail. The grip frame is serrated fore and aft. Grips are new replacement Hogue Rubber. Overall length is 8 5/8 inches from the muzzle to the end of the grip frame strut; height is 5 1/2 inches from the top of the rear sight to the bottom of the magazine floorplate. Slide thickness is only 1.10 inch at the ejection port, with 1.3 inches grip thickness. Weight empty is 34 ounces, with center of gravity at the trigger pin. This PT99 comes with its original pre-ban magazine capacity 15+1 rounds of 9mm ammunition fully loaded capacity. Finish is brushed surface blue barrel, slide, and furniture, with black anodized frame and retouched grips. Surface detractions are moderate to extensive, principally finish wear to the backstrap and edges. Note the department markings. We rate this Taurus as Good Condition, 70 percent vicinity by our estimate, but photos ought to suffice for our distinguished shoppers to judge finish grade for themselves. Bore, chamber, and mechanism are all bright and clean. We estimate this pistol was fired 1500 times during its career, for qualification, no rounds at all for a Taurus 99. Replacement pricing on a PT92 is well over $500. 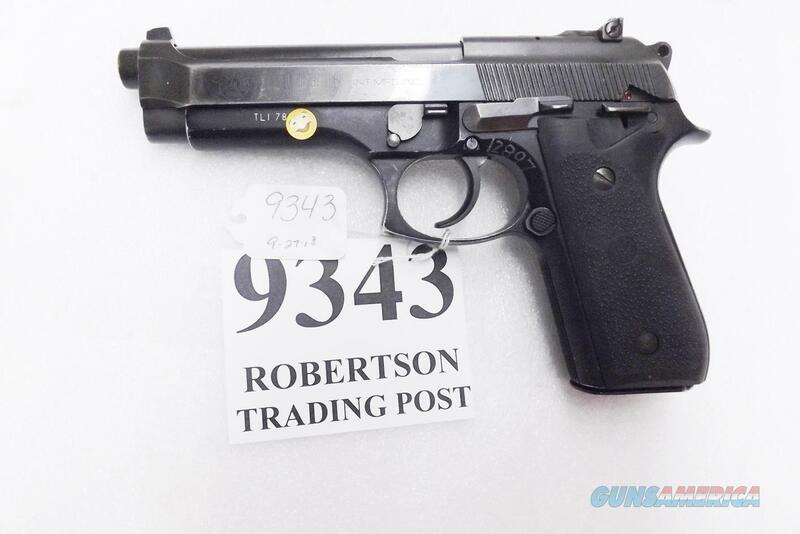 We're offering the 1993 Caribbean Taurus PT99 AF in the photos, however, for only	$ 319.00. Not transferable to civilian residents of California or Massachusetts. For civilian buyers in jurisdictions where 15 round magazines are restricted to Law Enforcement, we will sub one Mec-Gar 10 rounder for the factory mag. Affected jurisdictions include Connecticut, Hawaii, Maryland, New Jersey, New York, and Vermont for 10 round limit. Add any number of HFC blued steel 15 round magazines $16 each; Mec-Gar 15 or Act-Mag 17 rounders only $19 each; and Mec-Gar 18 round AFCs only $21 each.